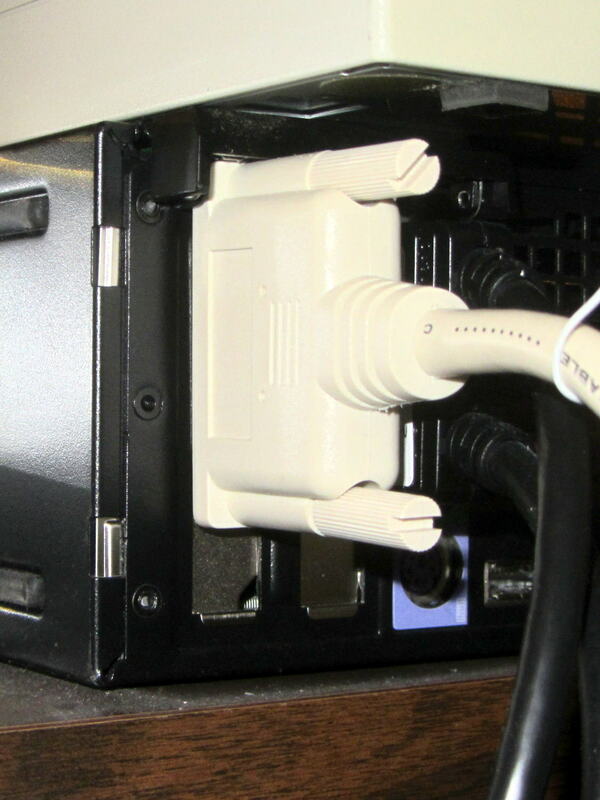 The old-school serial port card sitting atop it (from one of the off-lease Optiplexes in the stable) has a low-profile bracket that seemed promising, so I swapped the brackets. 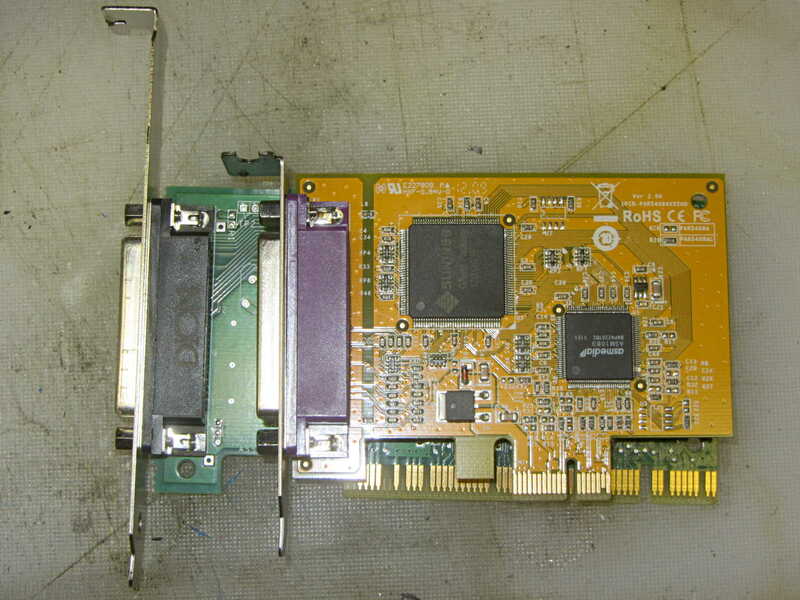 Alas, the SCSI card positioned the DB-25 just a smidge higher than the serial card, putting the right-angle top of the bracket about 2 mm above the ledge, where it prevented the locking cover from engaging. 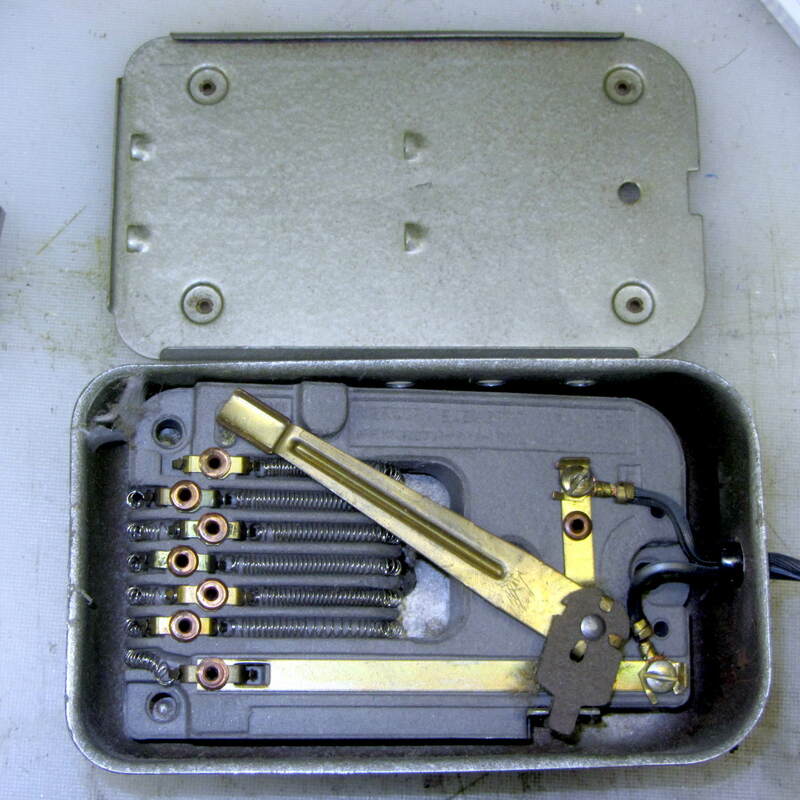 I filed the bracket’s DB-25 mounting holes into ovals, using up all the slop around the connector shell, to no avail. Close enough for me; the scanner (looming over the SCSI connector) works fine and delivers much better image quality / color balance than the crappy HP 7400C with an auto-feeder that I’d been using. 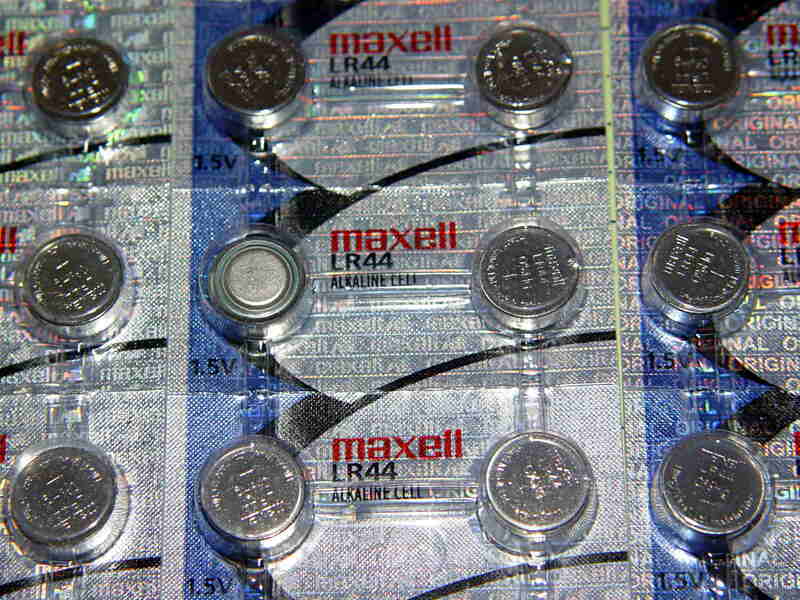 The production values seem high enough to suggest that they’re Genuine Maxell products, hologram packaging and all, but you’d expect the Maxell end-of-line QC should pick out a flipped cell. I blew out the fuzz, put it back together, and it works pretty well, modulo the usual low torque at slow speeds issue. 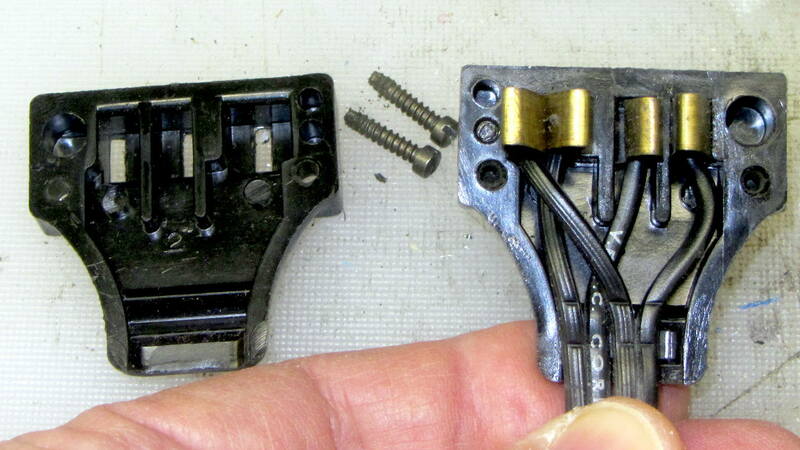 The discrete resistor taps produce a somewhat stepped response, but early reports suggest it’s not enough to be annoying; it’s much more stable than the carbon disks in the more recent pedals. The weakest fluorescent shop light fixtures always fail during cold weather (apart from the usual early tube failures) and this winter’s cold spells triggered the usual carnage, so I picked up half a dozen (cheap) 22 W LED T8 tubes and set about rewiring three defunct (cheap) fluorescent fixtures from the recycle heap. The new LED tubes run directly from the AC line; you must remove the fluorescent fixture’s ballasts / capacitors / starters and rewire the “tombstone” lampholders accordingly. 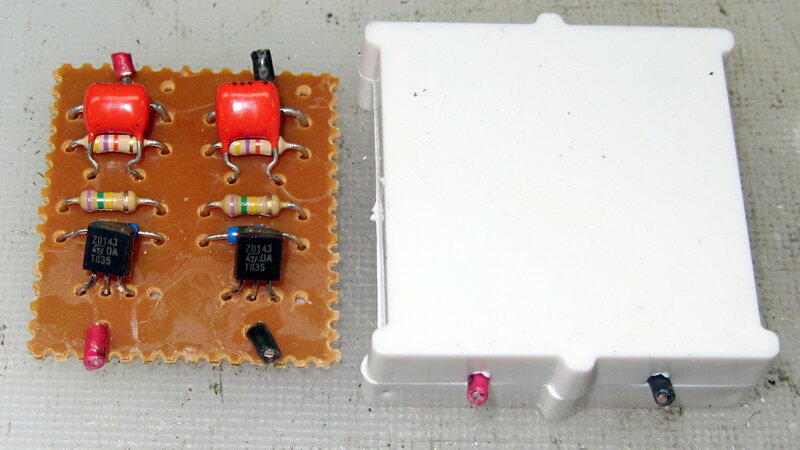 The 150 kΩ resistor has its leads twisted around the capacitor leads without benefit of that fancy solder stuff one might think necessary for a good connection. 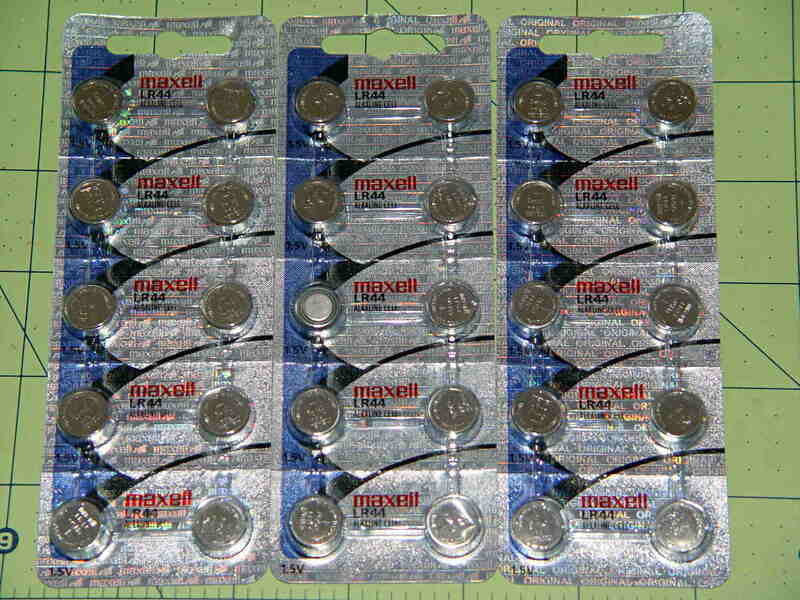 I think the caps use metallized Mylar film, but who knows? 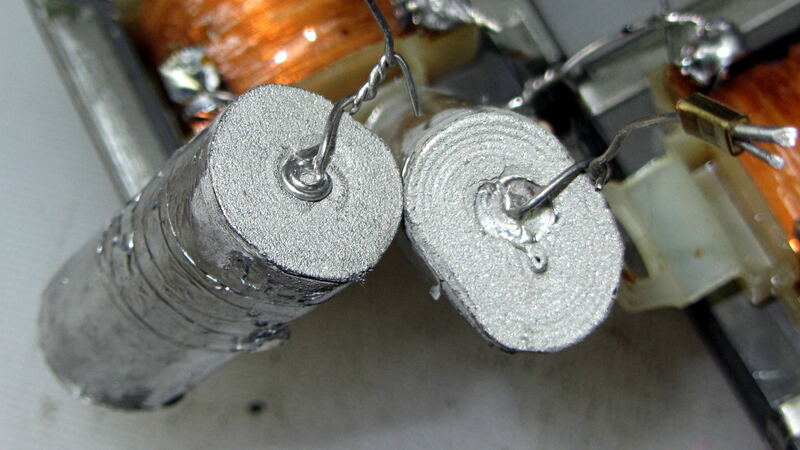 The inductors measure 280 mH and the caps a whopping 5 µF. 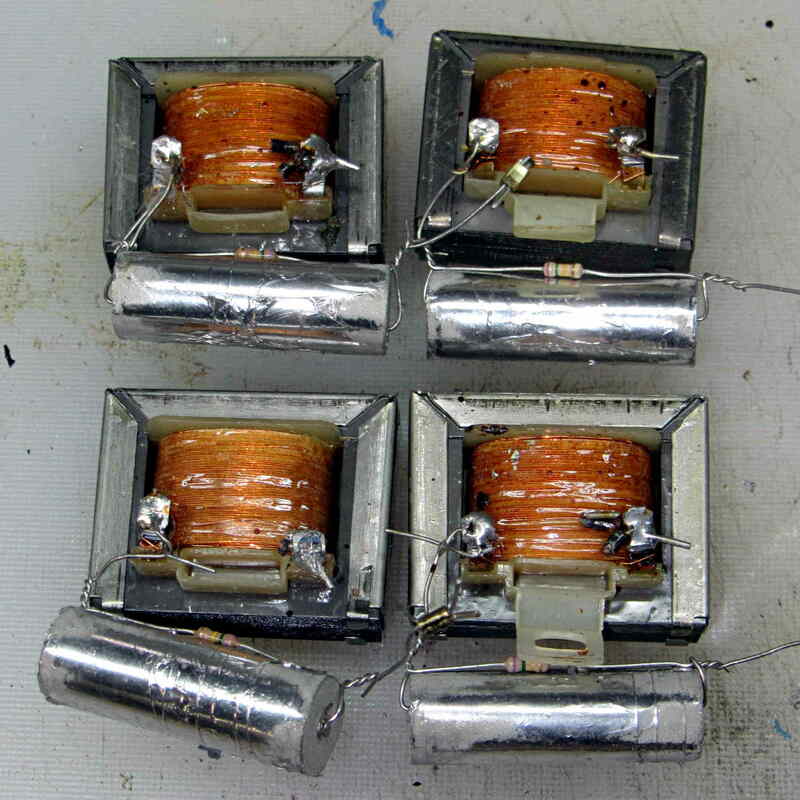 I might trust the inductors in a low-voltage circuit, but the caps have no redeeming features and went directly to the trash. The other endcap holds the power cord and has a green earth ground wire snaking out to a little tab passed into a slot punched in the metal case. 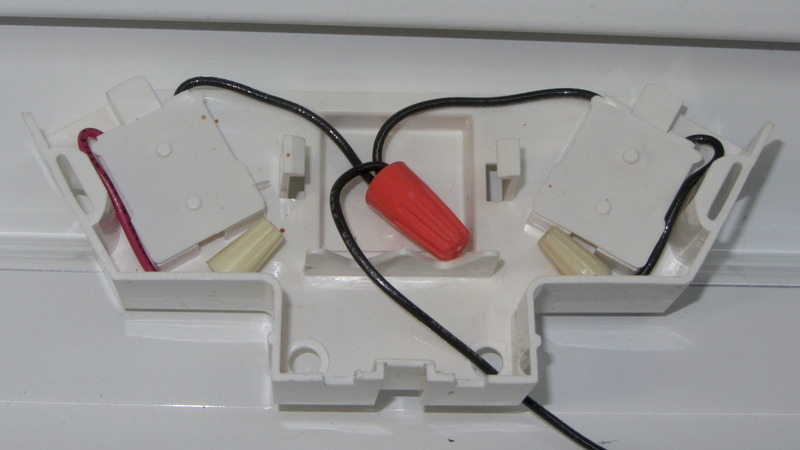 I replaced the tab with an actual screw / solderless connector / toothed washer, but have no pix to show for it. 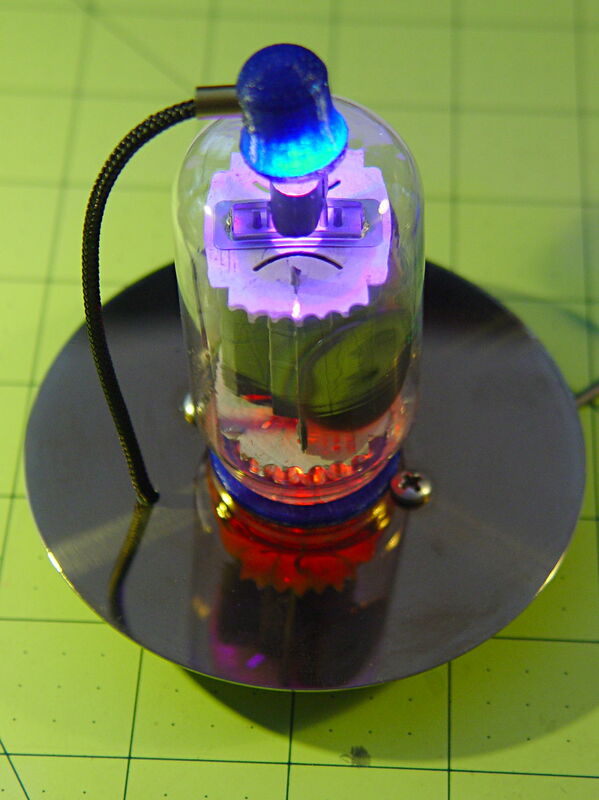 The LED tubes run at 6500 K and contrast harshly with the warm-white tubes in the fluorescent shoplights. I went with the highest light output, because even the best (cheap) LED tubes produce barely half the output of the fluorescents: 2000-ish lumens vs 3900-ish. 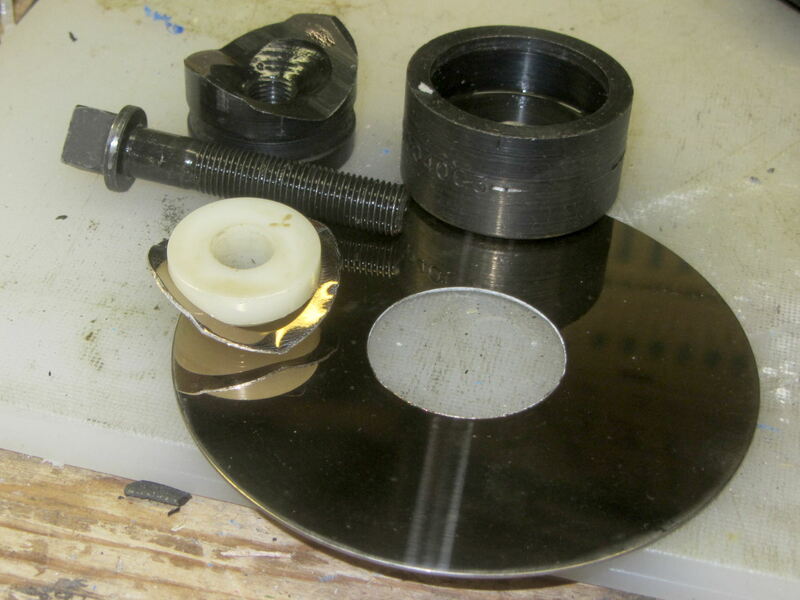 I lathe-turned that white bushing to align the hard drive platter around the screw inside the punch. The right way to make that bushing in this day & age definitely involves 3D printing, but I was standing next to the lathe and spotted a nylon rod in the remnants bucket underneath. The inner ring crumples around the bushing inside the die, while the platter outside remains flat & undamaged through the entire experience. 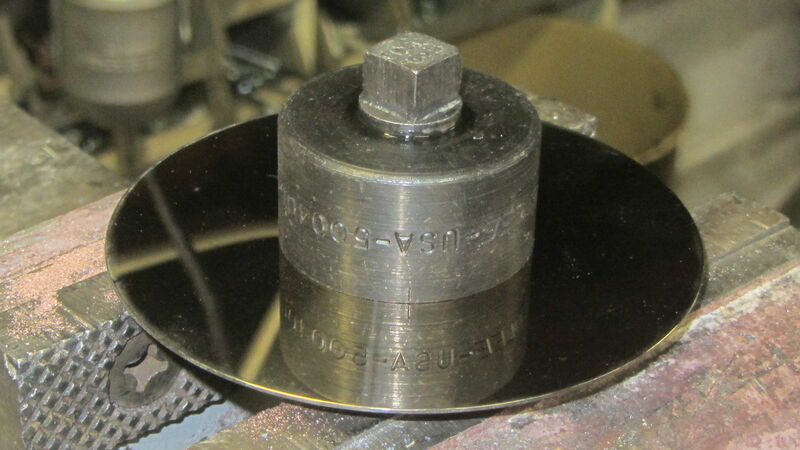 I match-marked the socket & “plate cap lead” holes on the punched platter and introduced it to Mr Drill Press, but the right way to do that for more than one socket / plate involves a Sherline mill fixture and some CNC. That’s obviously a proof of concept; the socket rests on the desk with the rest of the tubes / sockets / Neopixels tailing off to the right. The plate cap lead should pass through a brass tube fitting on the platter, just for pretty. The 7- and 9-pin sockets have a raised disk that’s slightly smaller than the 25 mm hard drive hole; the easiest fix involves slightly enlarging the disk to match the hole. 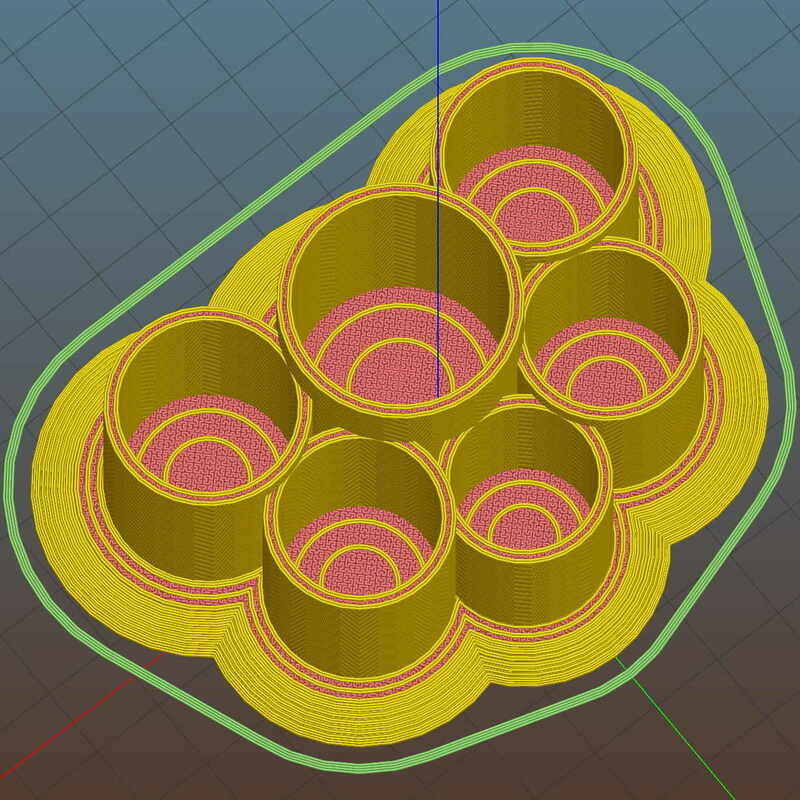 Although CDs / DVDs have a 15 mm hole and Greenlee punches work surprisingly well on polycarbonate, if I’m going to CNC-drill the screw / wire holes anyway, CNC milling the middle hole should go quickly and eliminate a messy manual process. 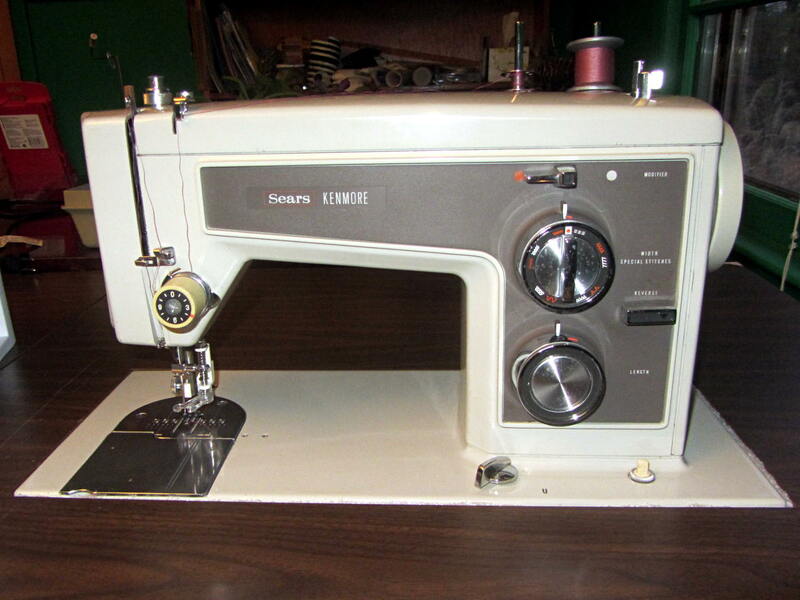 For reasons that should not require explanation by now, Mary just acquired a large sewing table (along with a Sears Kenmore Model 158 sewing machine that’s slightly older and fancier than the three we already have). 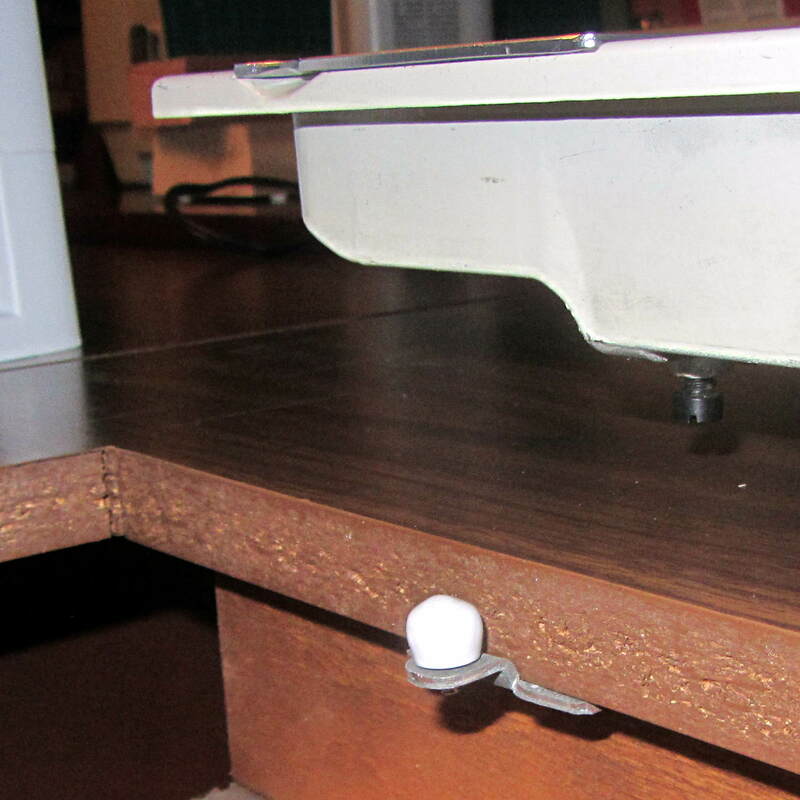 The table has an opening fitted to the machine base, but the rubber pads atop the leveling screws had long since stiffened up and two screws were frozen in place. 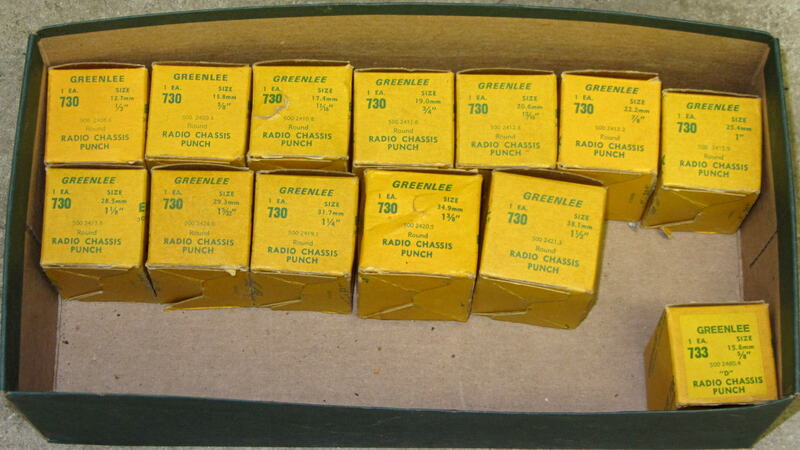 A few drops of penetrating oil released the screws and, mirable dictu, they have ordinary 6-32 threads. 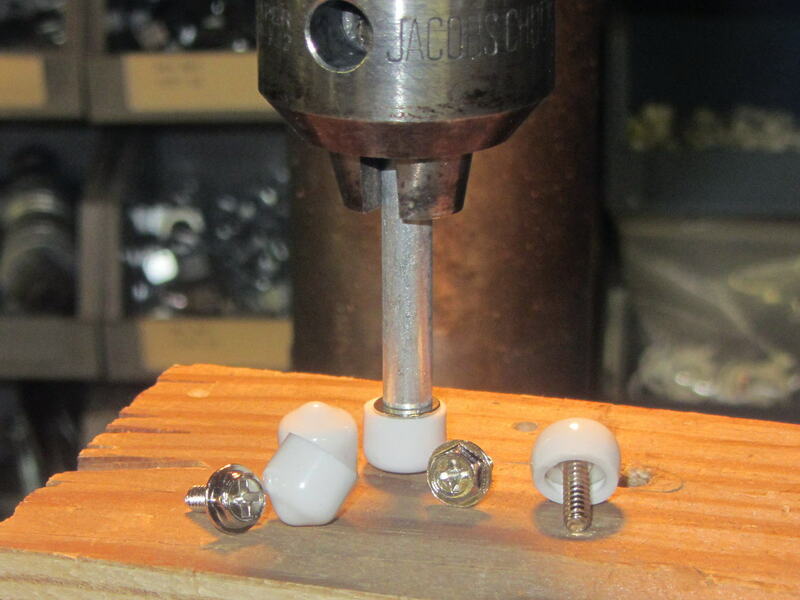 Once again, I’m using the drill press as a low-force arbor press, with a chunk of aluminum tubing to shove the screw flange into the slightly smaller plastic cap. Obviously, the foam will fall out whenever Mary lifts the machine to tinker with machinery under the platform, so we’ll see how often pins & needles slip through the cracks without the foam. That machine awaits a lighting update, because I’m awaiting some rectangular chip-on-board LED strips from halfway around the planet. 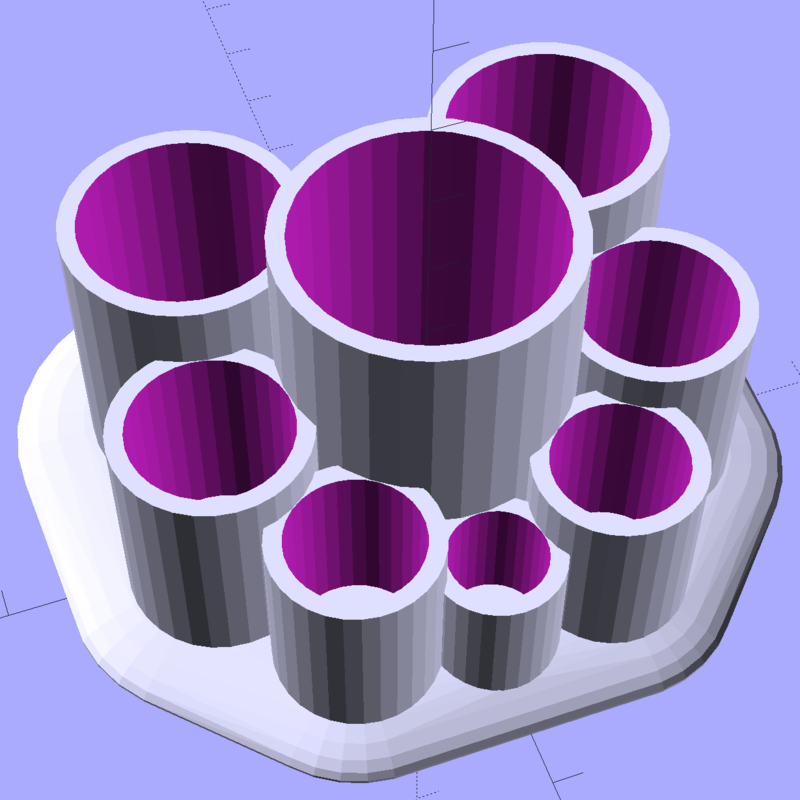 You hand the OpenSCAD program a list of desired tube diameters in the order you want them, the program plunks the first one (ideally, the largest diameter) in the middle, arranges the others around it counterclockwise from left to right, then slips a lilypad under each tube. As before, each tube length is 1.5 times its diameter; the lipsticks / balms fit loosely and don’t flop around. 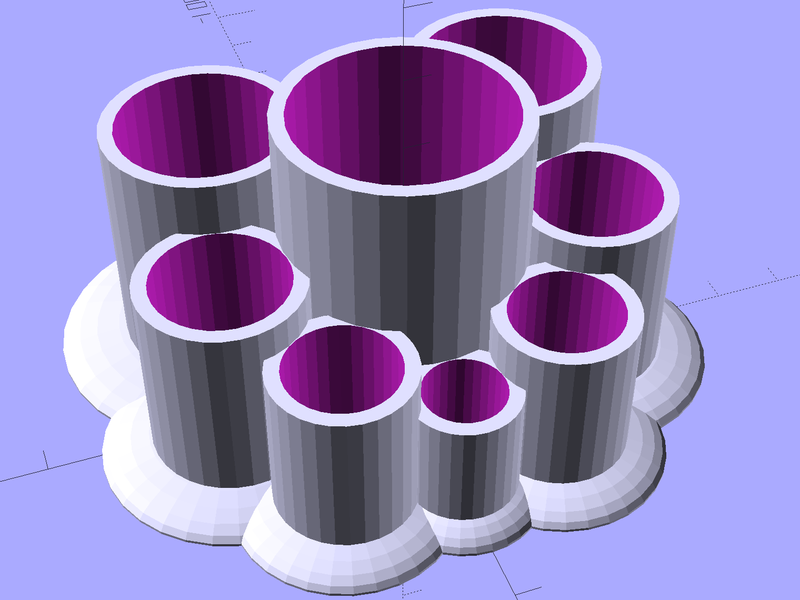 The pads are 2.0 times the tube diameter, which seemed most pleasing to the eye. They top out at 2.0 mm thick, which might make the edges too thin for comfort. 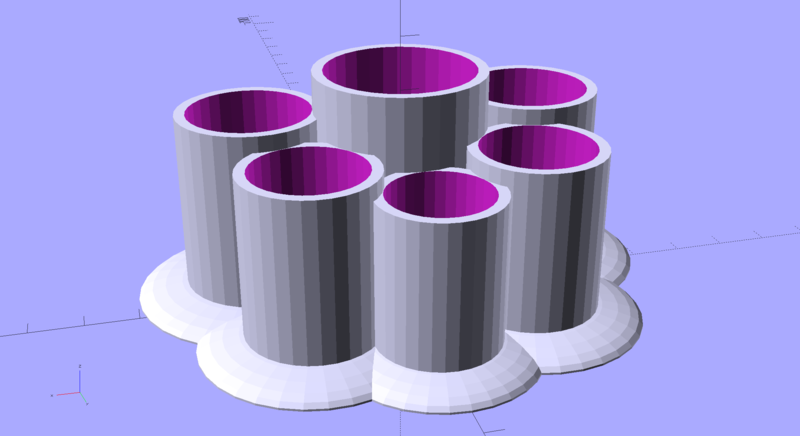 I’m awaiting reports from My Spies concerning the typical diameter(s) of lipstick tubes, then I’ll run off a prototype and see about the lily pad edges.